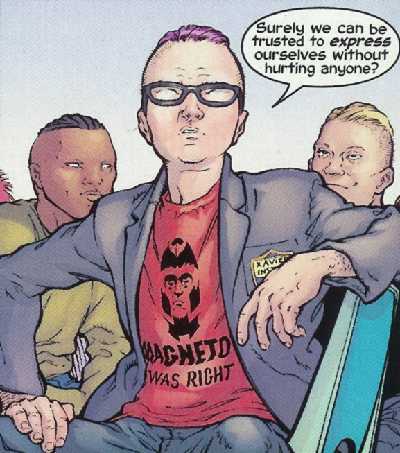 Call me Quentin Quire. Magneto was right. A widely-held defense of Marvel Comics’ X-Men states that their stories chronicle the trials of an emergent minority who are hated and feared by the rest of humanity. Race presents the easiest and most popular application of this comic allegory, and casts Magneto’s mutant uplift through global terrorism perspective against the global harmony across cultural boundaries philosophy of Professor Charles Xavier. The parallel beckons: we are to understand Magneto as Malcolm X and respect Prof. Xavier as Dr. Martin Luther King, Jr. Separation or integration, with superpowers. The African American political divide, replacing melanin with the mutant gene. But when we examine this metaphor in the context of major X-Men storylines in comics, animation, and television, we observe an alternate reality where a human being can gain extra-normal abilities like flight and super speed through the caprice of the genetic lottery, a new world where those not blessed with pyrokinesis or healing factors vote for dogmatic politicians who shuttle public money into robotics programs designed to meet the clear and present danger posed by this modern American minority with lethal force. In the X-Men, Prof. Xavier promotes mutual cooperation and understanding between humans and mutants, while Magneto argues for violent uprising against human oppressors, and the creation of an independent mutant state. Of course, this is offensively sloppy thinking, a political reduction so dramatic it approaches bad comedy. Numerous comics speak of the X-Men’s daily struggle to manifest Xavier’s dream, where humans and mutants live in peace and harmony together, as equals. Perhaps one day furry blue boys and translucent pink girls will join hands with little White boys and little White girls as sisters and brothers. Forgive the sarcasm, but come on! Nonviolent civil disobedience applied to the freedom struggle radiates the innocent desire for American liberty and justice to permeate the segregated South of police dogs and grandfather clauses, of night riders and bombed churches. Nonviolence applied to the mutant struggle is nonsensical. African Americans lacked political agency, given the Jim Crow South’s legal and extralegal suppression of the Fifteenth Amendment. Many Blacks subsisted without steady employment outside of sharecropping or domestic work, and lacked economic parity with their oppressive White neighbors. The point? Black race activists during the Civil Rights Movement argued from a position of political and economic weakness. Their experience under Jim Crow defines second-class citizenship for America. No one can claim that Emma Frost operates from a position of weakness. Don’t I look like I’ve been oppressed by the Man? The X-Men, inexplicably, never want for money. Once Xavier or a psi-successor dons Cerebro’s helmet and focuses their telepathy to identify a mutant, that mutant can be assured of a first-world sanctuary where paramilitary training and mercenary operatives abound, each a walking weapon of mass destruction. The Xavier Mansion hums with future technology, including a holographic Danger Room for training purposes and state-of-the-art research facilities. As you read X-Men comics about mutants who can walk through walls or control human minds with simple thought, it’s unavoidable: Magneto was right. An independent mutant state where mutants can realize their social and political potential without human interference makes sense when the alternative is an outcast existence where a genetic gaffe results in lifelong governmental scrutiny to respond to widespread public opinion. To realize Xavier’s dream, mutants must discipline their powers on the off chance that they can dissuade humans from the logical fear of teenage fusion reactors going through puberty. But Xavier underestimates the capacity of human fear. American White supremacists feared social integration for reasons too numerous and prejudiced to mention here, save one: Black buying power. Consider it: in a capitalist system, Jim Crow prohibitions against African American lunch counters and department store patronage does not compute. Businesses turned away money to support the social fiction of White superiority. 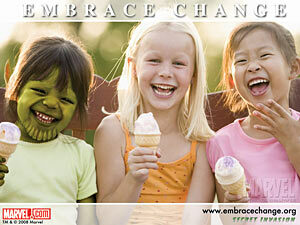 Post-integration, African American consumer power is too lucrative to ignore, projected to reach $1.1 trillion by 2015. Even though X-Men comic books are a license to print money, the House of Ideas never posited the mutant question in economic terms. In our world, terrorism and reality television are equally ubiquitous; since a mutant coming-out party can involve hospital visits, as the hapless lad who first kissed Rogue learned with difficulty, it’s unlikely that our modern public would ever relinquish fear of people who could shoot lasers from their eye sockets by lifting ruby sunglasses. No amount of baseball games could help those who require municipal police to protect their homes and their families from rational fear of a man who can touch everyday items to convert them into explosives. Call it law and order, call it fighting terrorism, but the descendants of the guards at Manzanar and Gila River live among us, and vote. They do not suffer difference lightly. Professor X would have mutants kneel before drunken bigots who punch them with brass knuckles and bash them with aluminum bats. Sure, he’ll send his gold and blue mutant military to intervene sporadically, but Xavier’s operations philosophy uses the superhuman potential of his X-Men as a quasi-state sanctioned police force, directed to stanch needless bloodshed from both humans and mutants, without concern for bigoted provocation. This is asinine – when mutants are cornered by bloodthirsty mobs who reek of alcoholic courage, mutants should respond to their violent provocation with violence, because the martial application of their mutant abilities can make the real-time difference between life and death. To refuse to use your own agency to protect your life is suicide. No one who can bend steel in his bare hands need ever turn the other cheek. Professor Xavier himself doesn’t buy his civil disobedience sales pitch; in modern X-Men tales, Xavier uses his academic and military contact to ingratiate mutants with the ruling American power structure. In the recent X-Men: First Class, Xavier holds court with top military brass to flaunt mutant covert operations potential, less Dr. King than P.T. Barnum. The good professor’s ethical reputation notwithstanding, state-sanctioned mutant paramilitary operations should chill the bones of every mutant sympathizer alive. What need has the federal government of closed circuit cameras on every street corner and unmanned drone surveillance when they can employ broadband telepathic suggestion to ensure domestic tranquility? No, Magneto was right. Mutants are the children of the atom. They need not construct hidden lives in open-air woodland reservations surrounded by federal sentinels controlled by human security guards or submit themselves to government conscription as voices deepen and breasts bud just so Claremont and others can pretend that the X-Men offer some vague parable on civil rights. Magneto’s considered a mutant supremacist, a global terrorist warped by the Holocaust into an immovable hatred of the human condition. I think he’s just honest. If the X-Men were bestowed by our Creator with flesh and form, we’d be at war. Since Thucydides’ History of the Peloponnesian War, military realism has overruled Golden Rule morality in state action. 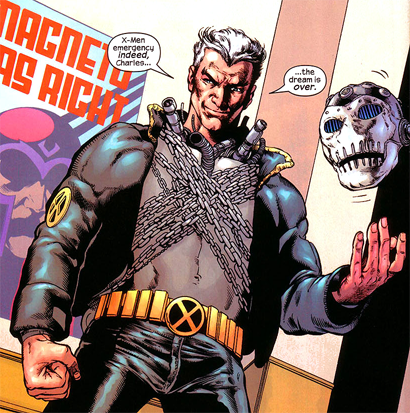 The X-Men have a guy so powerful that when his powers manifested he blew off his own mandible – they are not weak! Place the weather manipulator on the Edmund Pettus Bridge and John Lewis walks away with his skull intact. Prof. Xavier’s position on the mutant question misunderstands the premise – there is no superior species, only victors and vanquished, winners and losers. Guess who gets to write history. To be honest, this is why Chris Claremont, Len Wein, and others rushed to cement the X-Men narrative in the Movement legacy. The marchers won. Somewhere between freedom summers and bloody Sundays, the Movement secured tangible legal and economic victories that benefited all Americans, rolling back poll taxes and fighting off housing discrimination. Newly political minority groups used the Movement legacy to attack workplace sexism, anemic AIDS research funding, and English-only voting infrastructure. The Civil Rights Movement reshaped America by dismantling existing racial paradigms with blood and guts and television, with soaring rhetoric and dead little girls. This was miracle. But Gerry Conway was right – “The comics follow society. They don’t lead society.” So while we all enjoy watching the scarlet tragedy writ by grey Canadian adamantium, let us use the X-Men not as a grand re-telling of Movement drama, but as a warning to all who crave mainstream acceptance of their community’s story. Besides, if you gave Nelson Mandela mastery over magnetism in 1964, he too might turn the world upside down to incite change. Only insanity replaces the Movement’s melanin with the mutant gene and expects a peaceful world.